U.S. Ambassador to the United Nations Nikki Haley speaks during an emergency Security Council meeting on Syria at U.N. headquarters in New York, April 14, 2018. The United States, Britain and France said Saturday that their military strike on Syrian chemical weapons storage and research facilities was legal and justified. At an emergency U.N. Security Council meeting called by Russia, the three powers dismissed Moscow's accusations that they had violated international law and the provisions of the U.N. Charter. "The United Kingdom, France and the United States acted — not as revenge, not as punishment, not as a symbolic show of force," said U.S. Ambassador Nikki Haley. "We acted to deter the future use of chemical weapons by holding the Syrian regime responsible for its atrocities against humanity." 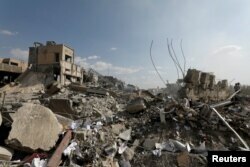 The destroyed Scientific Research Center is seen in Damascus, Syria, April 14, 2018. The allies dropped 105 missiles on three Syrian chemical weapons facilities early Saturday morning. The Syrian government repeatedly has denied using chemical weapons against its population and says the April 7 attack on Douma, near Damascus, was staged by "terrorists" with the assistance of foreign intelligence agencies. Haley said the U.S. was "confident" the strikes "crippled" Syria's chemical weapons program. Moscow's envoy said the three powers acted before allowing the fact-finding mission from the Organization for the Prohibition of Chemical Weapons, a watchdog group, to carry out its investigation. The inspectors arrived in Damascus on Saturday. They are there to determine whether and what kind of a chemical attack took place, but not to attribute blame. 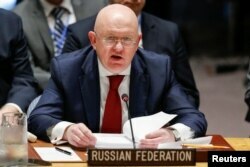 Russian Ambassador to the United Nations Vassily Nebenzia speaks during an emergency Security Council meeting on Syria at U.N. headquarters in New York, April 14, 2018. "This is how you want international affairs to be conducted now?" said an irritated Vassily Nebenzia. "This is hooliganism in international affairs, and not minor hooliganism, as we are talking about major nuclear powers," the Russian envoy added. Moscow's efforts to win Security Council condemnation of the strikes in a resolution overwhelmingly failed. The draft, which sought to condemn the strikes as a violation of international law and the U.N. Charter, received only three votes in favor from the 15 council members. Russia, China and Bolivia supported the measure, while four members abstained and eight voted against — including the U.S., Britain and France. "Some, who for years have flouted the most basic rules of international law, today are affirming that our action runs counter to the U.N. Charter," said French Ambassador François Delattre. "I would remind them that that charter was not designed in order to protect criminals." 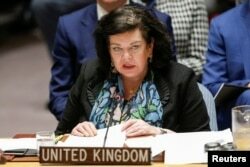 Karen Pierce, the U.K. ambassador to the United Nations, speaks during an emergency U.N. Security Council meeting on Syria at U.N. headquarters in New York, April 14, 2018. Britain's ambassador said she would "take no lessons" in international law from Russia. "It is hard to believe that it is in line with the principles and purposes of the [U.N.] Charter to use or condone the use of chemical weapons," Karen Pierce told council members. She told reporters ahead of the meeting that London "believes it was both right and legal" to take military action "to alleviate further humanitarian suffering by degrading the Syrian regime's chemical weapon capability and deterring the use of chemical weapons." The three allies have not given up on a political solution to the Syrian conflict. France said it was preparing a draft resolution to address chemical weapons use, the humanitarian crisis and the peace process in Syria at the Security Council. Russia's ambassador was dubious, telling reporters the environment was "not very conducive for any rapprochement," and that "first we have to sort out the political and dangerous military situation we are in now." U.N. Secretary-General António Guterres urged parties to exercise restraint and find a political solution. He said he would have his Syria envoy, Staffan de Mistura, travel to New York as soon as possible to consult with him on the most effective way to accelerate the political process.